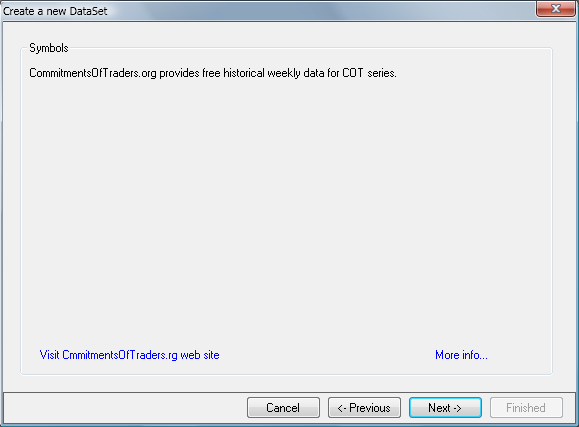 This is a static provider that downloads Weekly legacy historical COT (commitment of traders) data provided by CommitmentsOfTraders.org. The legacy report is broken down in three categories: Commercial traders, Non-commercials traders and Nonreportable positions (small traders). We prefer the traditional report whose interpretation guidelines are widely available and which also has the benefit of having more historical data. There's an alternative provider for COT data: Quandl. Unlike this "legacy data" provider, it includes Open Interest and supports the CoT data in "new format".